Stereolithography, a technique related to 3D printing, consists of applying resin layers one by one to create three-dimensional objects. Its cost and deadline make it an interesting prototyping technology for quantities of fewer than three parts. However, it is not suitable for parts whose visual and functional appearance is important. Indeed, stereolithography does not allow a prototype to be obtained that is close to a series part because it does not use allows the the “right material”. It is not recommended for productions requiring the running of visual and mechanical tests, and other alternative uses of stereolithography should be found. 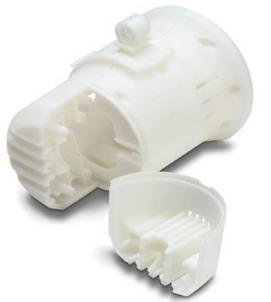 FDM (fused deposition modelling): FDM technology is another 3D printing technique. It offers functional properties slightly superior to stereolithography. It consists of a 3-axis machine which deposits a fused filament on the prototype in production. Unlike stereolithography, the deposited material cures immediately. There is no need to use UV light. However, while the materials used can produce slightly more functional prototypes, they do not allow a visual rendering superior to stereolithography. SLS (selective laser sintering): the SLS process enables the design of 3D objects using powdered materials deposited in successive layers. The materials used can produce metal or plastic parts. This technology is slightly more functional than stereolithography. It offers better ageing and superior precision. However, it does not offer a better visual rendering and remains very limited. Indeed, the finish is porous or grainy. CNC machining: the advantages of CNC machining over stereolithography are numerous. Firstly, this method uses the right material. Thus, the functional and visual properties of the parts are superior and close to those of series parts. In addition, when the quantities reach 3 parts, CNC machining production is faster and more financially attractive. Finally, CNC machining is not subject to the problems of stereolithography (bad ageing of parts, fragility, etc.). Vacuum casting: beyond a dozen parts, vacuum duplication is advantageous as regards the financial aspect and production time. The parts obtained from a silicone mould are much closer to reality and to a series part. In addition, this technique allows more finishes: mass coloured parts, transparency, addition of overmouldings or inserts, etc. For more information, see also the advantages and limitations of stereolithography.